Esther Meier is our project manager extraordinaire. 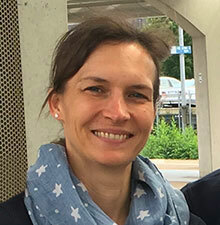 She has over ten years of experience in project management working in the education department for the Autostadt, owned by Volkswagen in Wolfsburg Germany. She is highly organized and has a unique ability to see both the big picture and the details. Esther is an expert in cross-cultural communication and works easily in a global environment. As a child, her family’s frequent treks throughout Europe in a variety of VWs awakened her interest in other cultures and languages. After a year as an exchange student in the U.S. she studied cultural science at the innovative University of Bremen and the University of Bologna. She loves yoga, reading Italian novels, and her family.